According to Olivier Jeantet 2011 was a "vigneron's vintage". Following a problemless, reasonnably cold, winter, March was extremely rainy, with 300mm of rainfall at the end of the month. Then, like everywhere in France, very hot weather (up to 32°C) dominated in April. As a result, bud break was three-weeks earlier. This led to heterogeneous flowering. Rainfalls in that crucial time aggravated the situation. Fortunately, unusual freshness in July restored some balance and resulted in a normal veraison. 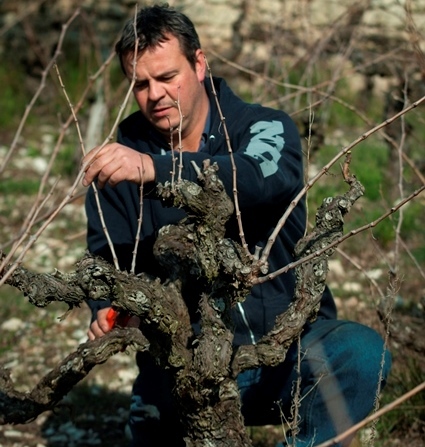 "We even thought that we would be able to harvest at the usual date," Olivier Jeantet recalls. But heavy storms in August, with again the association of heat and water, accelerated the ripening process, and grapes harvest started earlier than expected. Due to the heterogeneous flowering, ripeness varied significantly in each of the plots. "As a result, it was hard to anticipate and decide when to harvest," explains Olivier. "We had to find the right balance between mature and very ripe grapes, without losing the acidity." Repeated pre-harvest berry sampling and analysis as well as plenty of patience eventually helped harvest healthy grapes, with excellent acidity.